As a Baby Boomer coming of age in the 70s, I held Kurt Vonnegut dear to my heart. Here was a sci fi writer who bravely broke out of the genre with his lauded novel Slaughterhouse Five, yet also lent his considerable wit and knack for pithy prose to some of the most entertaining sci fi novels I’ve ever read. I held him in such esteem that I created an imaginary baseball team whose player names were all taken from Vonnegut novels. One Vonnegut concept that particularly intrigued me was Ice-9, an apocalyptic substance that brings about (spoiler alert!) the end of the world in his classic novel Cat’s Cradle. Turns out that Kurt got the idea for Ice-9 at least partly from his brother Bernard, a scientist who worked for General Electric back in the 50s when the company sponsored research into cloud seeding to make rain. Kurt also worked for GE as a writer, and it was this confluence of science, growing political repression, and Kurt’s own wacked-out mind that gave us the writer who penned The Sirens of Titan, Player Piano, and other tales in addition to the ones already mentioned above. 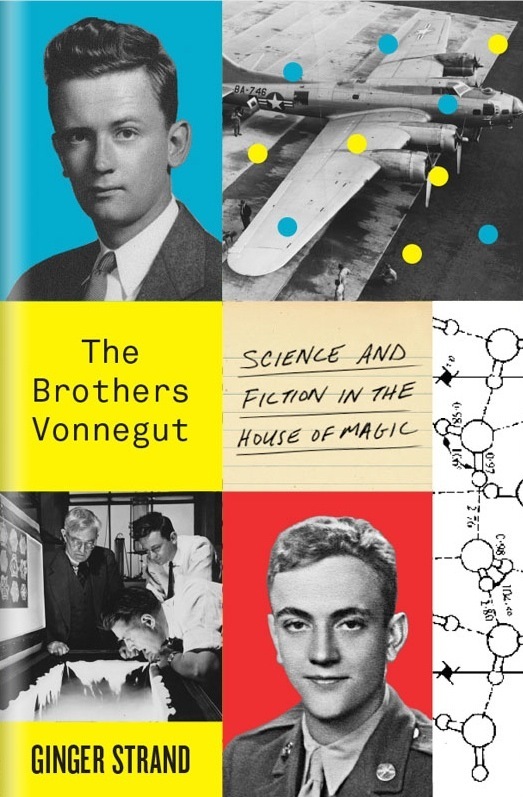 The Brothers Vonnegut, by Ginger Strand (Farrar, Strauss & Gireaux, 2015), gives us a double-barreled biography of the brothers, following both Bernard’s research at GE as well as Kurt’s struggles as a writer before finally breaking into print. She also describes the intersection of weather science and military aspirations to use weather as a weapon as war, at a time when our nation had only recently entered the nuclear age and its attendant Cold War. It was paradoxically a time of great, foolish faith in Scientific Progress, and destructive paranoia as artists, political figures, and company workers alike were blacklisted by anti-communist fanatics. The cloud seeders fit both of these paradigms. The popular press, egged on in no small part by writers such as Vonnegut, proclaimed a new era in weather control—no more droughts or catastrophic floods, and even dangerous hurricanes would soon be able to be deflected into a harmless course. Ironically, they lauded the possibility of melting the earth’s icecaps as a way to increase global warming, thus improving agricultural production! (Hopefully, these propagandists aren’t still alive and working for Big Oil.) Strand captures all these events and personalities with style and verve; you don’t have to be a Vonnegut fan to enjoy reading it. Just as I finished this book, I stumbled on a few articles on a new scientific breakthrough that seemed to come out of a Vonnegut novel itself: the first creations of something called a Time Crystal. This is a crystal that not only oscillates in space, it oscillates in time as well, going through a series of reconfigurations that repeat themselves. No, you can’t put one on a pendant and wear it while balancing your aura—the one I read about consisted of a small number of ytterbium ions, all with “entangled electron spins.” Which means we’re entering the weird world of Quantum physics here. Still, you gotta admit: “Time Crystal” has that swag about it, and who’s to say the Enterprise won’t have them embedded in dilithium in the future? I bet if Vonnegut were alive to today, he might well find a way to put a Time Crystal into a hilarious novel about the end of the world. Enter your email address to subscribe to J.S. Webster's blog and receive notifications of new posts by email. I love cinnamon rolls; I want to live with a cinnamon roll. I could, in fact, spend the rest of my life with one.